Los Antiguos, what to do - Los Antiguos, Patagonia, Argentina. This oasis in Patagonia, Los Antiguos, is located in the northwest corner of the province of Santa Cruz. Video courtesy of Los Antiguos Municipality. The origin of its name comes from a legend that the ancient elders tehuelches chose this place as a last resting for its pleasant microclimate, so that its name is a translation of the word tehuelche "I keu kenko" or "I keu konk" which means "my ancestors" or "the ancients". Los Antiguos, city of about 1,800 inhabitants, offers a world of tourist attractions, a magical place nestled in a fertile valley with the Andes as part exclusive. 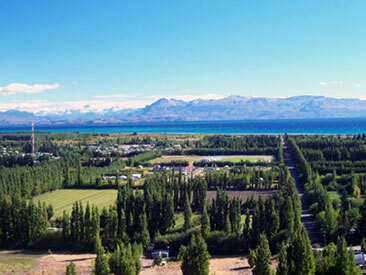 Los Antiguos is located in a bordering area with Chile and on the shores of lake Buenos Aires, where economic activity par excellence is the fruit and vegetable production, although fish exploitation of the lakes is also important. 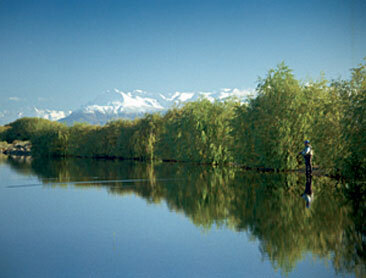 In Los Antiguos you can fish both in Lake Buenos Aires and in Jeinimeni and Los Antiguos rivers. Photo courtesy M Basalo. One of the most important fruit products and that forms the main source of production in the region is the Cherry. Los Antiguos is recognized as the National Capital of the Cherry and in the first days of January there is performed the Cherry Festival. About this fruit is offered an interesting tour of the farms that are dedicated to its production. On this tour you can observe the lake Buenos Aires, Patagonia's largest lake and second largest in South America after Lake Titicaca. This lake is surrounded by rivers Jeinimeni and Los Antiguos in which you can find species such as brown and rainbow trouts, temptation to fishermen around the world. Thanks to being surrounded by rivers, Lake Buenos Aires, offers the unique possibility of fly fishing in any season, in two different ecosystems. Panoramic view from the entrance to Los Antiguos, here you can see the fertile valley, the lake and the Andes. Photo courtesy M Basalo. Geographically, Los Antiguos is located very near the Cave of the Hands. These are paintings of the civilization that inhabited the area 10,000 years ago and left these paintings as evidence, that given the degree of conservation and the environment in which they were executed, they impress all who come to see them. The Cave of the Hands in 1999 was declared Cultural Patrimony of Humanity by the UNESCO. In the Cave you are able to perceive the predator-hunting culture through their art, which has left shows of their customs, hunting techniques, rituals and beliefs, the environment and the conditions in which life happens, facts that have been protected by the Pinturas River's Canyon. Lake Buenos Aires has its festival Since 2002 the city of Los Antiguos in Santa Cruz celebrates the "Lake Buenos Aires Festival". During the last days of October and early November this party celebrates sports practice on the lake and awareness of the environment. Fly Cast Congress The Fly Cast Congress takes place in mid-August in Los Antiguos, Santa Cruz. The conference extends over three days where fishing, tying, exchange of information and other actvities are held, and of course anecdotes on everything. Cherry Festival Since 1991, during the first days of January the city of Los Antiguos in Patagonia celebrates the Cherry Festival. After the harvest of cherry, the city honors this delicious red fruit. Fall and Easter weekend in Los Antiguos In fall, Los Antiguos offers a landscapes ranging from red to orange. On a tour of the farms you can taste their products or try your hand at fishing. Road of Mount Zeballos from Los Antiguos 1Route 41, also known as the Road of Mount Zeballos, goes through lakes, rivers, hills, forest and steppes, a landscapes combination you can enjoy walking, horseback riding or fishing. A ranch day in Los Antiguos The city of Los Antiguos offers the possibility to visit the variety of farms that surround it in which you will be able to tour the plantations of fruits and vegetables, taste products, learn how they are processed on a farm.